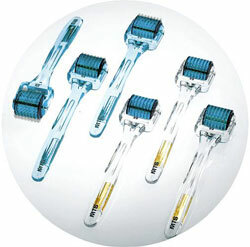 US based company Clinical Resolution Laboratory developed the first generation of the Microneedle Therapy System or MTS-Roller™ in 2004, marketed for the treatment of Medical Skin Needling. three for medical use by trained nurses, doctors, surgeons etc. (CR10 – 1.0mm, CR20 – 2.0mm and CR30 – 3.0mm). The MTS-Rollers™ are equipped with 200 needles, made from surgical stainless steel, mounted along a 21.5mm wide roller with 8 needles per horizontal row; this is the highest number of needles of any medical skin needling roller on the market, according to the manufacturer. They create miniscule holes of 0.07mm diameter with a penetration depth of between 0.13mm and 2.5mm. As well as being targeted for use in collagen induction therapy for skin rejuvenation, the MTS-Rollers™, in combination with a patented peptide based hair rejuvenation product called MTS Peptide HR Matrix™, have also been successfully applied to the indication of hair restoration in cases of alopecia. This treatment proved 80% more effective in combination than by simply applying the product on its own, claim the manufacturers. The cosmetic 0.2mm model is also available within a MTS Anti-ageing Complex kit for home use. This includes a variety of adjunctive pre- and post-treatment peptide products and a sunscreen. It is also available in a MTS Hair Treatment Complex kit which includes the peptide hair rejuvenation product. 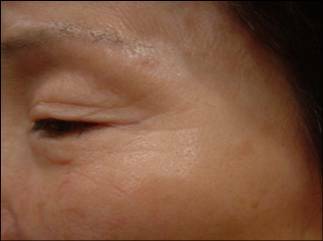 Clinical studies carried out in South Korea on 54 mice in 2006* showed that treatment with the MTS-Roller™ is more consistent in increasing the thickness of the skin than IPL (in this case the Ellipse device). The mice were treated with either one IPL treatment given 3 times at 2 week intervals or 5 passes (15 strokes) with a 0.5mm roller at the same time intervals. 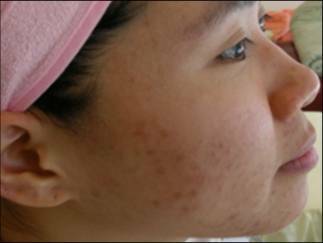 Skin thickness was then evaluated at 8 weeks. 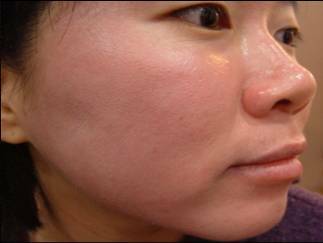 Improvement in acne, before and after treatment. 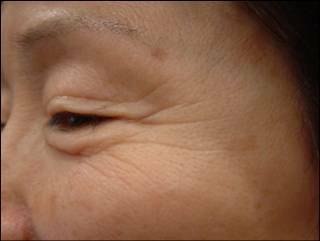 Improvement in crow`s feet wrinkles, before and after treatment. Images above provided courtesy of Wigmore Medical Ltd. The MTS CR3 roller is available for approximately £70 and the Anti-Ageing and Hair Treatment Complex kits retail for £115. A single, in-clinic treatment with the MTS-Roller™ is likely to cost from £250+, depending on the area treated (e.g. face, hands etc.). Treatment course packages are often available at a discount. Click for ALL Microneedle Therapy System - MTS-Roller™ clinics in the UK & Ireland registered and verified by Consulting Room.